Using an innovative financial model, Salut Bar Americain is saving energy, saving money, and doing good for the planet—all while staying focused on their core business. Salut Bar Americain is one of Edina’s most popular neighborhood restaurants, known for great service and an eclectic french menu. Salut’s owner, Parasole Restaurant Holdings, actively works to be good stewards of the planet and conserve energy. And, like any businesses, they watch their expenses closely—especially their utility bills. Parasole Restaurant Holdings, recently installed energy efficient LED lights and mechanical system sensors in new restaurants in Galleria and in Burnsville, and liked the results. The switch to the new, high-efficiency lighting went unnoticed by staff and patrons, and the range hood fans operated at significant savings. Salut Bar Americain was a natural next step for Parasole to install LED lights and kitchen hood controls. 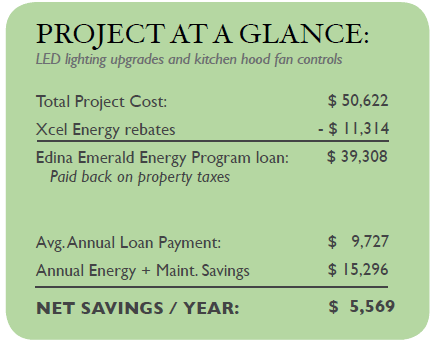 Working with EnergyMisers LLC’s president Bill Bieganek, Salut discovered that the Xcel Energy efficiency rebates would reduce the total upfront cost to $39,308 – and the energy and maintenance savings would provide a simple payback of just 2.5 years. This project was a great investment for the restaurant and would not have been possible without the collaborative effort between Parasole, Energy Misers, and Xcel Energy. PACE and the Edina Emerald Energy Program were a natural fit for Salut Bar Americain. The Edina Emerald Energy Program is Minnesota’s first Property Assessed Clean Energy (PACE) program, authorized by the Minnesota legislature in 2010. EEEP is a voluntary tool that allows business owners to finance energy efficiency improvements and renewable energy systems via their property taxes, thus creating a zero-down, cash-flow-friendly impact on their bottom line. Eutectics Consulting’s President, Jeremy Kalin, was the chief author of PACE legislation when he served in the Minnesota House of Representatives, and today leads Eutectics Consulting’s energy financing work. Eutectics’ Main Street Model partners directly with the City of Edina and Minnesota-based investors to make clean energy financing easy for business owners. Eutectics is pleased to welcome Bremer Bank as the nation’s first community bank PACE investor; in total Eutectics has lined-up more than than $20 million of PACE investment. Jeremy Kalin is the president of Eutectics LLC. Click here to download the original case study.